With an inspiration and hero, Mr Achmat Dangor. 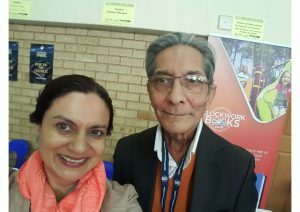 Jozi’s Books and Blogs Festival (Lenasia, July 2017). I walk amongst giants and am humbled. Raashida Khan (Raashi) is not your typical 50-year old South African Indian Muslim living in Johannesburg. She was born in Durban, her favourite city where she lived for the first twenty-seven years of her life. She studied at the University of KwaZulu Natal qualifying with BA Hons (Economic History). Raashida worked at a bank before marrying and moving to Gauteng where she worked as a project manager at NGOs, and in client service at several marketing and advertising agencies. She loves books and reading and has always wanted to write fiction. Raashida has been married for twenty-two years and has two sons, aged 19 and 17. A content creator, copywriter, editor and proof reader by day, she is as passionate about being an author, poet, wife, mother and friend – a unicorn that does exist. As a caring, compassionate and empathetic person who loves observing people and life, she is a storyteller of note. She would like to be remembered as ‘never boring’. Her short story Your Voice, My Strength was selected as the winning entry for the 2017 Irtiqa Online Magazine (South African Muslim Women’s Short Story Competition). Another short story, It’s not Funny, appears in the Happy Holidays Anthology available on Amazon. Her contribution, Hungry, darling? appears in Saffron: A Collection of Personal Narratives by Muslim Women (launched 8 April 2018). Her contribution to ‘Drumbeats from Africa’ has been accepted and will appear in this anthology to be published in 2019. She has published an anthology of poetry, Happy Birthday, Raashi, and plans on publishing two novels in 2019. In the meanwhile, she continues penning emotional, emotive poetry and the occasional social commentary blog. Raashida’s first novel, Mirror Cracked won the debut category in the Minara Aziz Hassim Literary Award for 2017 (prize awarded in July 2018). Currently she is writing the sequel, Fragrance of Forgiveness and an anthology of short stories.